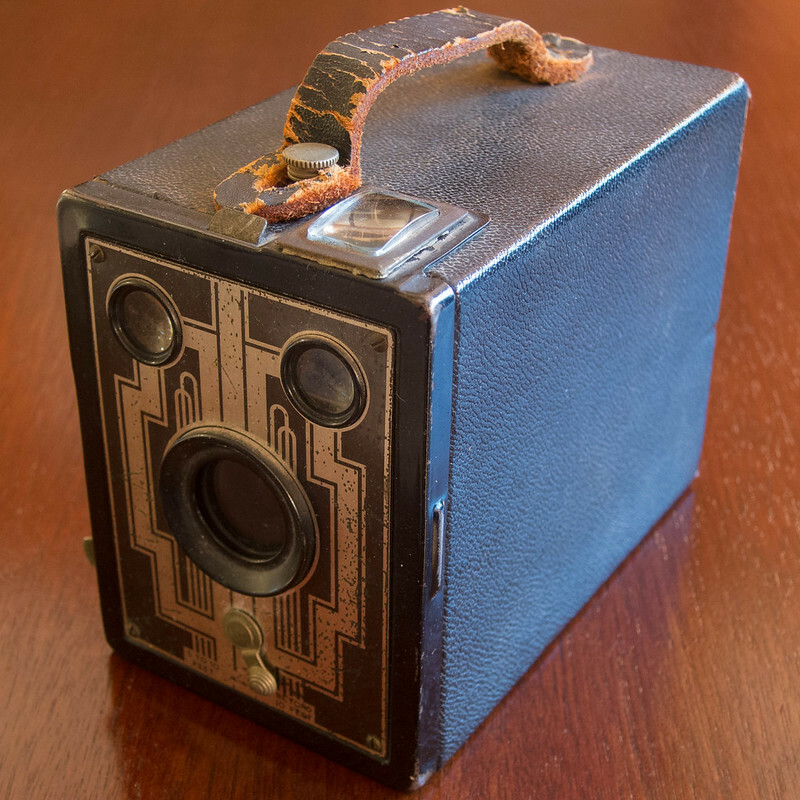 Somebody gave me this box camera, a Kodak Six-20 Brownie with an Art-Deco-inspired faceplate, a few years ago. The timing was bad: I had just decided to swear off 620 film and cameras. I had neither the patience to spool 120 film onto 620 spools, nor the willingness to spend 12 bucks and up for pre-respooled film. But a couple months ago I discovered a pile of eBay Bucks near expiration. And then I found a roll of Verichrome Pan in 620, expired in 1982, that those Bucks paid for. Free film!! So I dug out this old box. 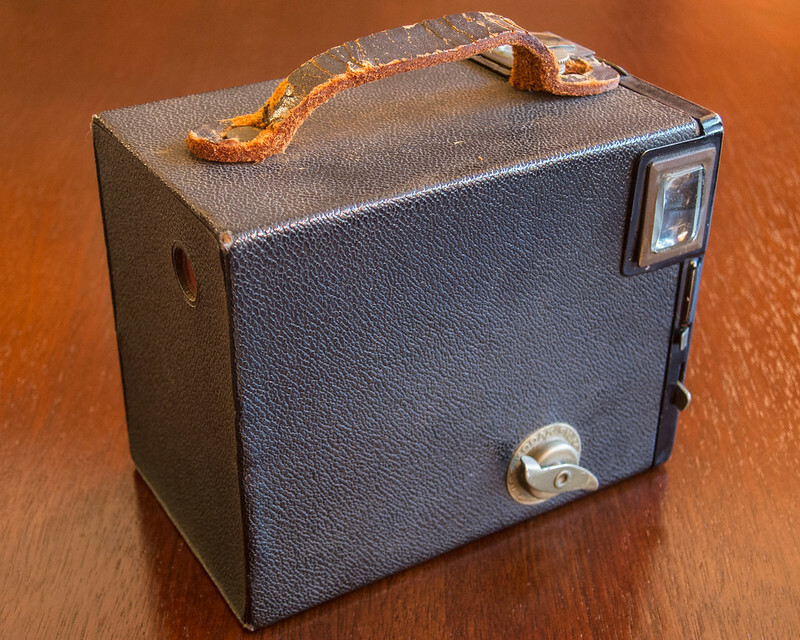 Kodak puked out box Brownies by the legion during the first half of the last century. This model was made from 1933 to 1941. Original price: $2.50. According to the Bureau of Labor Statistics, that’s equivalent to $46 in 2016. As box Brownies go, this one had some unusual features. Almost all the box cameras I’ve known come apart at the back for film loading and unloading. This one comes apart at the front. You pull out the winding knob, pull up on the knob that anchors the carry strap’s front end, and tug on the camera’s face. The Six-20 Brownie has two apertures, controlled by the tab atop the faceplate. Down selects the larger aperture; use it for most shots. Up selects the smaller aperture; use it for extremely bright conditions such as beach or snow scenes. The camera also offers a single shutter speed plus timed exposures. The tab on the faceplate’s side controls it; pull it out for timed shots. I’m guessing that the shutter operates at somewhere between 1/30 and 1/60 sec., and the two apertures are something like f/8 and f/16. And while the camera’s lens (a simple meniscus) is inside the box, an external lens focuses the camera for shots at beyond 10 feet. For shots from five to 10 feet, move the lever below the lens opening to move the external lens out of the way. Release the lever and the external lens springs back into place. This camera was filthy when I got it, so I cleaned it up as best I could. The pitted faceplate was beyond help. The viewfinders had gone opaque with crud, so I dismantled them and cleaned them. One of the mirrors was loose, so I superglued it back into place. Then I spooled in the Verichrome Pan. The best shot on the whole roll is of my sons. That kills me, because it’s long been my policy not to show photos of them here. 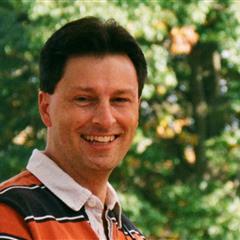 I should write in detail about why someday; a couple of principles are involved. And it’s the only shot I took with the front lens moved out of the way. Darn. But here’s the second best shot on the roll. I don’t know how this Verichrome Pan was stored, but it sure behaved like fresh film. 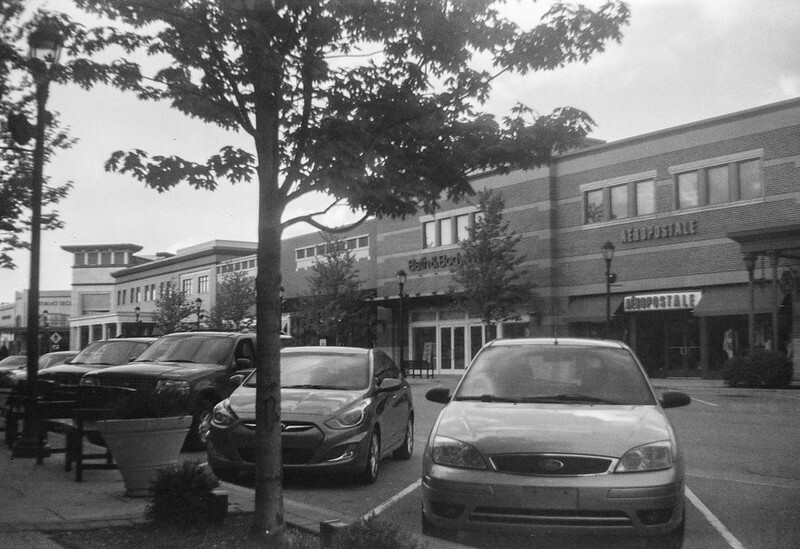 This was the only shot affected by light leak. I wonder if it might have happened while I removed the film from the camera, as I fumbled it a bit and the end of the roll came a little loose for a half second. This was the last photo on the roll. I don’t know why I persist in using box cameras to photograph distant subjects. They’re meant to take photos of Aunt Martha and the nephews at closer range. When I framed this, the main part of Leon’s filled the viewfinder. But I shot it from across the street. 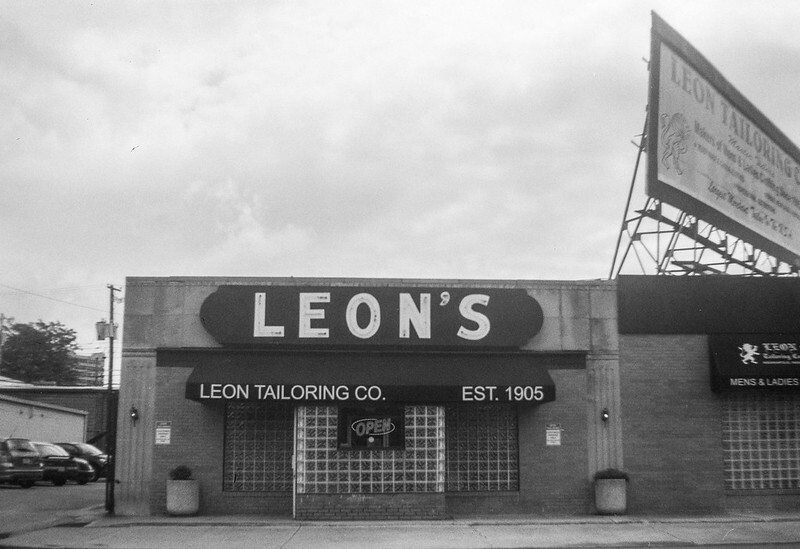 Oh, and by the way, I recently bought a suit from Leon’s. It was a great experience. I had the Brownie along one day when I took my son to dinner at an outdoor mall in Noblesville. Sharpness and contrast are pretty good here, despite a little haze in the sky around the tree branches. A couple photos were pretty muddy. I worked them over pretty good in Photoshop to improve contrast. Here’s one of them, of the mural is on the back of the Indianapolis Public Schools administration building Downtown. 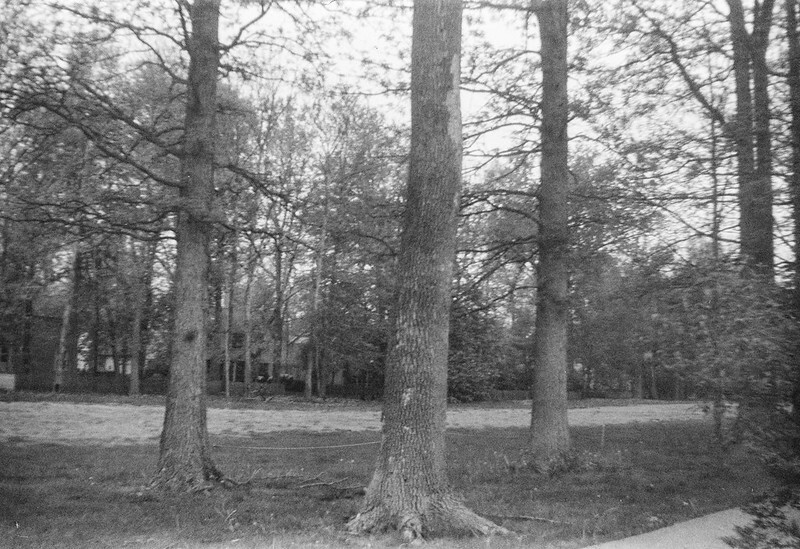 This was the muddiest photo of them all, of the three trees on the golf course behind my house. The front ash tree has been dead for at least a year; the bark is starting to fall off. Anyway, Photoshop restored reasonable contrast to this scene. At full scanned resolution, a little motion blur becomes apparent, convicting me of moving the camera slightly as I made this exposure. But at print size, you’d probably never notice it. 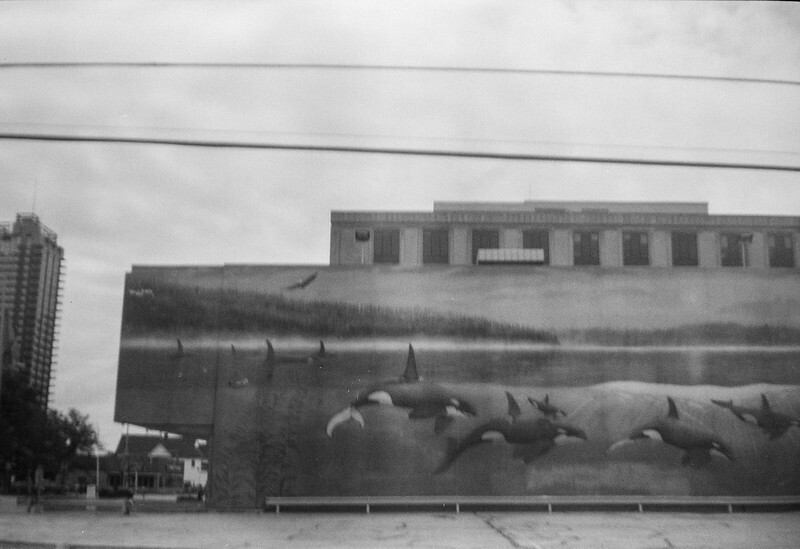 To see more photos from this roll, check out my Kodak Six-20 Brownie gallery. It’s charming to shoot with simple cameras like this Six-20 Brownie. Even when the results are so-so, it still always pleases me that I got images at all. 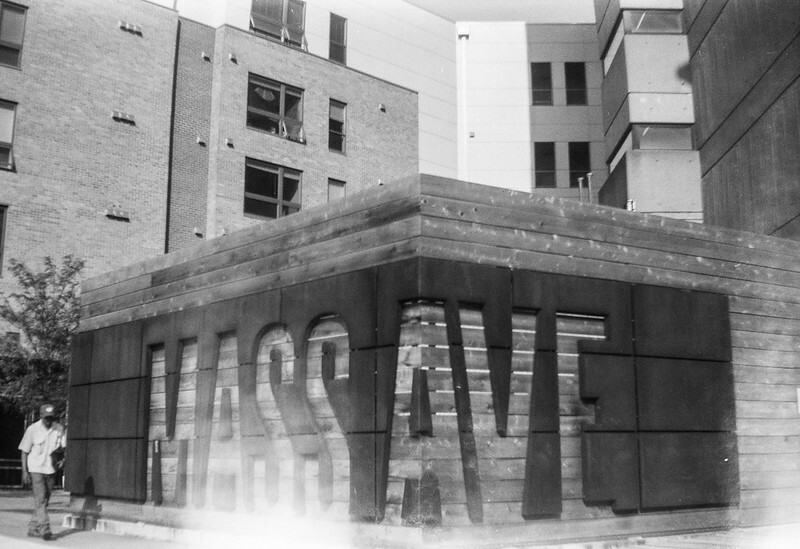 It’s easy to forget that a light-tight box and the simplest of lenses — even a pinhole — will make an image. And these turned out pretty well. You’d never guess that I used film expired for more than 30 years.